Gloria Jean Lewis was born on December 31, 1936, in Beaumont, TX. She moved to Pascagoula, MS in 1956, where she remained until her death on Monday, July 23, 2018. Gloria was the second of two children born to her parents, Donnie and Corine Nowlin, who preceded her in death. She was also preceded in death by her husband of 20 years, James H. Lewis, Jr.; brother, Robert Earl Nowlin and nephew, Robert Earl Nowlin, Jr.
She is survived by daughters, Donna Sherrie Johnson, Carla Marie (Mike) Welborn and Belinda Rene Davis; grandsons, Michael (Terri) Daily, Adam Buckley, Jackson Davis, Logan Davis and Corin Davis, along with other family and friends. She was very fortunate to have found love again late in life with William Earl Nicholson and they remained close, spiritual companions and cared for each other until the time of her death. 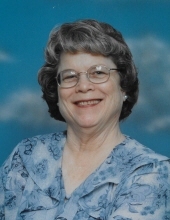 She was a member of St. Paul’s United Methodist Church, and attended Mosaic Church both in Ocean Springs. Gloria retired after 25 years of service with the Mississippi Department of Corrections and Circuit Clerk’s Office of Jackson County. Special thanks to Dr. Richard Whitlock for his special care over the many years and especially during these last few difficult years. The visitation for Gloria will be held on Thursday, July 26, 2018 from 1:00 p.m. until 2:00 p.m. at Heritage Funeral Home in Escatawpa, MS. The funeral service will follow in the funeral home chapel beginning at 2:00 p.m. Entombment will be held at Jackson County Memorial Park in Pascagoula, MS.
To send flowers or a remembrance gift to the family of Gloria Jean Lewis, please visit our Tribute Store. "Email Address" would like to share the life celebration of Gloria Jean Lewis. Click on the "link" to go to share a favorite memory or leave a condolence message for the family.